Cephalid Constable ($0.97) Price History from major stores - 10th Edition - MTGPrice.com Values for Ebay, Amazon and hobby stores! 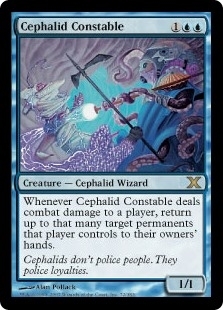 Card Text: Whenever Cephalid Constable deals combat damage to a player, return up to that many target permanents that player controls to their owners' hands. Flavor Text: Cephalids don't police people. They police loyalties.